I found a dress on dressilyme.com, I knew it wouldn't be 100% same as the picture as they just copy the original photo. I had custom measurements but with petticoat it shortens it, I want the big and poofy look so need the petticoat, how can length be added? Also, the bodice in original photo has satin bodice, but my dress has a netting layer over the top of satin for some unknown reason, can this be removed easily? Also I want to add some swarovskis to the dress, maybe even replace the smalls pearls with the swarovski, is this possible? Thanks for sending in all the pictures. They help me see what you need. You really have a bridal alteration and restyle question. To lengthen the gown, if you have on the correct shoes, the outer tulle net is at the right length but the satin liner is a little short. You can add to the inner lining but not extend the netting. So the only thing that could be done here is add a strip of fabric around the bottom on the satin layer. But I want to make you aware that because the tulle is thinly layered, the seam would be noticeable. The bodice net cannot easily be taken off if it is sewn in the seams with the satin. You could risk damage to the under fabric. So most seamstresses wouldn't attempt it. It's easy to add embellishments to the dress. You can take the pearls off if they are sewn on and not glued on to the gown. But I would just leave the pearls and add the crystals because they are usually paired together on beaded garments. 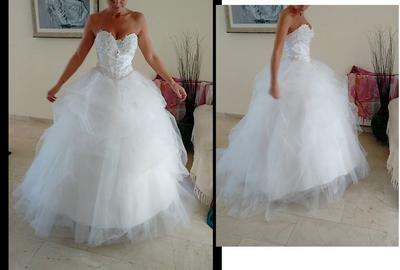 I would check with a local wedding Dressmaker or Alterations Specialist experienced in bridal to see what they suggest. Also, the cost could be more than what you paid for the wedding dress. 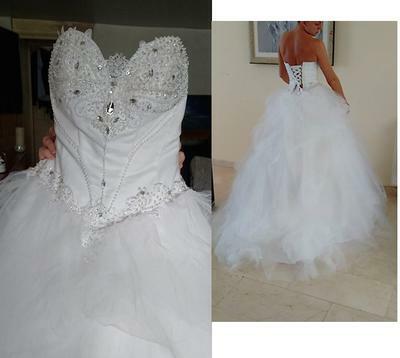 As a wedding dress alterations specialist and former bridal dressmaker I had many situations where a bride brings in a dress and wants to change the look of it. 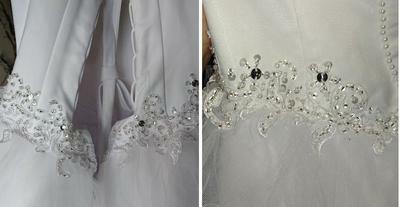 Some wedding dress alterations and redesign changes are easy to do, others are not. Some would require a complete recutting of the gown. There, of course, are limits to what can be done and a cost factor to be considered. To help brides determine if it is worth the effort and cost I ask a couple of questions. One is, what is the value of the dress in its present condition, whether it is new or used? I don't suggest putting more into a bridal dress than the value, unless the style changes really is going to make it look incredible. The other quetion is will the change help the design or take away from it? I don't suggest doing alterations or changes that look like something was done to the dress. No alterations or redesigning should not be detectable. What is done to the gown should look like it was designed to be that way, not something added to the design. If the change is going to be noticable...I recommend that it not be done. Some cases it's better to just get another dress than to correct it. Another consideration is what you are going to do with the bridal gown afterward? Are you wanting to sell it or are you just patching it up to get through the day? Are you keeping it as an heirloom dress? What you plan to do with it after the wedding has an impact on how much money you should put into restyling a dress. So if you are thinking about altering or restyling a wedding gown, these are points are important to consider when you need extensive alterations or restyling.